Blog, it’s been a while. Since my last post (was it really November 2013!?) Jan and I welcomed a new member to our family, our son, Axel, now age 14 months. Parenthood has kept us busy and added a whole new dimension to our food and travel adventures (more on that to come hopefully here on the blog). We also recently moved to a new home, so we’ve had a lot going on! The food I’m writing about today is one we’ve just recently discovered, and also something that everyone in the family enjoys (the little one is really into meat and mashed potatoes, and I don’t blame him)! 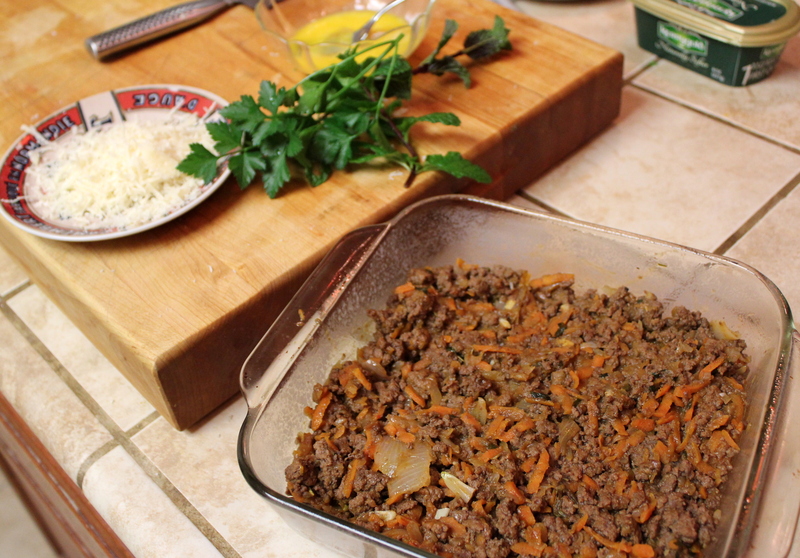 It all started when I saw shepherd’s pie on a menu somewhere and suggested we try making it ourselves sometime. The first time Jan made it, we both asked ourselves, where has this food been our whole lives, and why haven’t we been eating it all the time? We’ve tried it with a few variations, and throughout this experimentation process, realized we’d actually been calling it the wrong name. 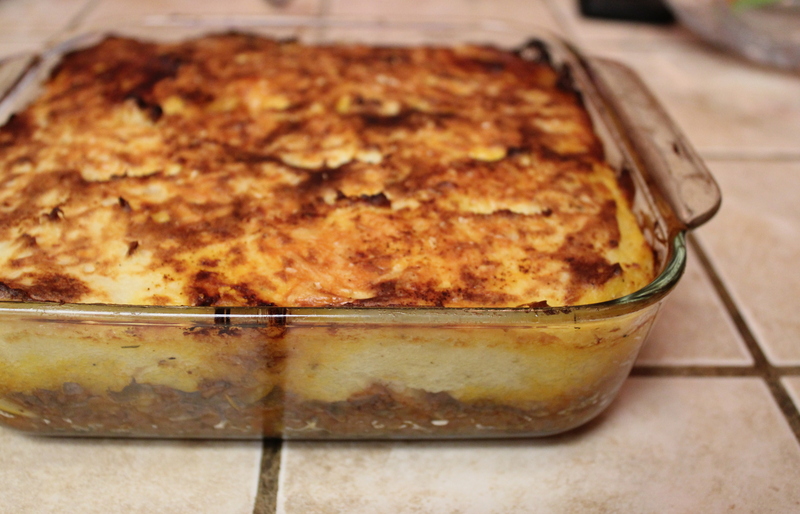 Shepherd’s pie is made with lamb, and cottage pie is made with beef. Definitely prefer the beef version. We cook ground beef with onions, garlic, shredded carrots, tomatoes and red wine. We also add some rosemary, thyme and parsley. We make our standard mashed potatoes with just russet potatoes, butter, milk, salt and pepper (I’m always in charge of this job because Jan does not add enough butter). I set a little bit of the mashed potatoes aside just for Axel to eat later, and to the rest, add one egg yolk (this will help it set up on top of the beef when baked). 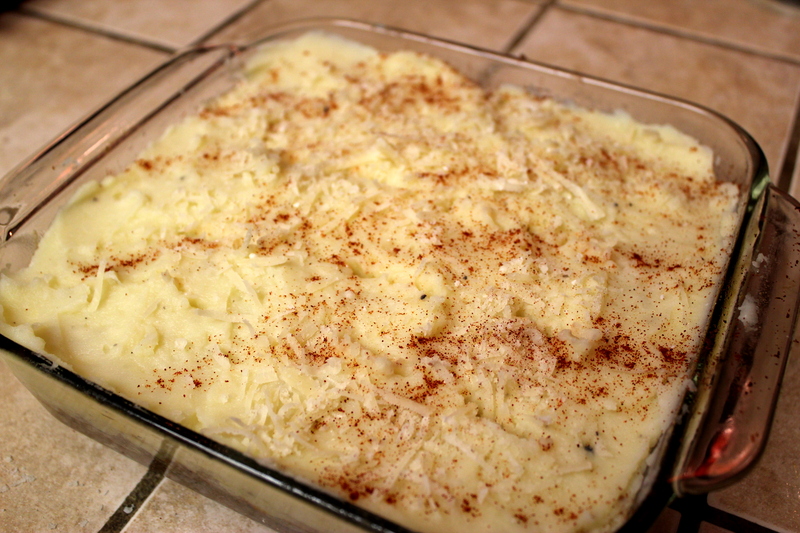 In a baking dish, we add the layer of mashed potatoes on top of the beef layer, then sprinkle with paprika and some freshly grated Parmesan cheese, and bake! Looks delicious – welcome back! Hi, Anna, I continue to enjoy your blog. Re: cottage pie: the ironic thing is that cottage pie or shepherd’s pie is a pub food that has gotten such a bad reputation. I probably have extremely pedestrian tastes in food BUT I admit to loving pub food. (good pub food, not poorly made pub food) On a different note, I am making my family shrimps cakes for New Year’s Eve.